At Tuesday night’s ANC6b meeting, Commissioner Dave Garrison summarized what DDOT is proposing extending the Performance Parking Plan to most streets between 8th Street and 11th Street, SE, and Pennsylvania Avenue and I Streets, SE. This would make parking harder for non-Ward Six parkers. A likely consequence is that non-Ward Six parking will be pushed north into streets where parking rules are more flexible. The problem will become more severe with the opening of The Hill Center this summer, thus setting up a dynamic for extending the parking restrictions further north, possibly to East Capitol. In an early Sunday morning email to some of the residents in the affected 8 or 9 block area, Commissioner Oldenburg said the new plan would be announced at the March meeting of ANC6b. In a post on her blog on Monday, Oldenburg revised her announcement by adding that “if necessary, I am more than willing to set up a petition process so that blocks can opt in or out of these changes.” It seems likely that any blocks not participating would become sanctuaries for non-Ward 6 parkers. Ninth Street resident Karl Kindel raised objections to the procedure that was being followed, which he said, presented no options, but only a fait accompli. ANC6b Chair Neil Glick and Commissioners Ivan Frishberg and Brian Pate supported a more transparent and inclusive process than what was apparently being followed in this instance. Imposition of the plan by DDOT would also affect residents who invite guests to their homes – a burden that would have to be addressed by application for temporary parking permits – police-issued multiple one-day and multi-day passes. 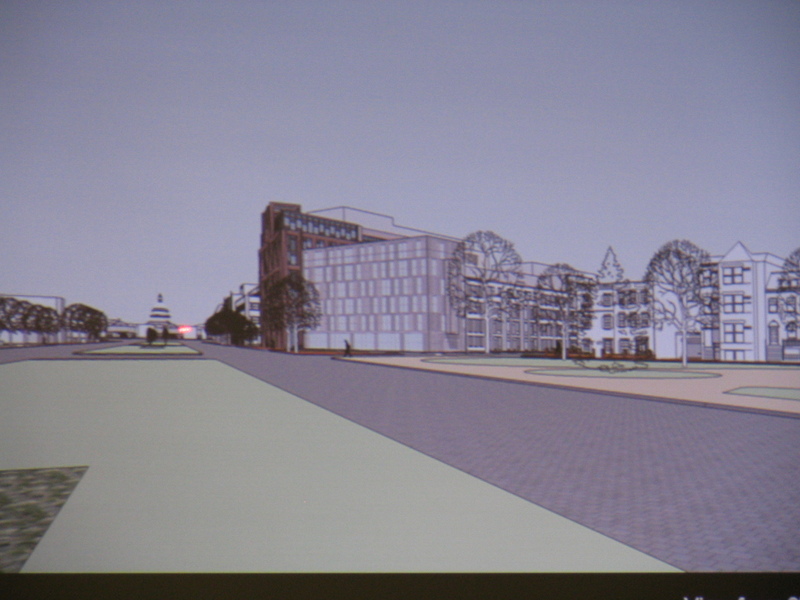 The new plan would provide for each residence with only a single guest parking pass. It was not clear at the end of the meeting whether ANC6b would require a stricter degree of consultation with residents before the DDOT plan is effected, but it does seem to be the case that blocks may opt out of the program by majority vote. Oldenburg also reported that she was starting discussions with the Marines and with DDOT for parking restrictions for the 800 block of G Street and the 700 block of Ninth Street, SE. Some residents asserted later that there had been no prior notification of this development to the community. The possibility that residents of a block shared by the Marine Barracks might be excluded from negotiations with the Marines about parking was a special point of concern. Kindel had negotiated what he said was a very satisfactory agreement with the Marines about 12 years ago, and wants resident input to make sure any adjustments do not create other problems. 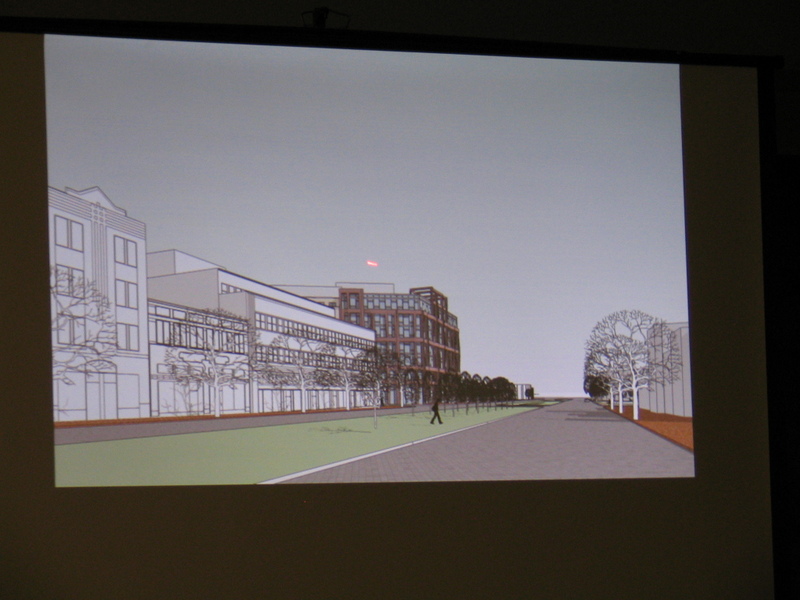 On Tuesday night, ANC6b, at its regular March meeting, approved a new plan for receiving community feedback on the redevelopment of Hine School. The Historic Preservation Office (HPO) announced at 5:30pm Tuesday night that the Historic Preservation Review Board’s (HPRB) consideration of Stanton-Eastbanc’s Historic Preservation Application (HPA) will be deferred until April 28, at the request of ANC6b. Originally, HPRB was scheduled to take action on Hine at its March 24 hearing. As previously announced, ANC6b will conduct a Special Call meeting – a meeting of the ANC outside of the regular monthly schedule and focused on a single issue – on Tuesday, March 15, from 6:00pm to 9:00pm at St. Coletta’s School, 19th and Independence, SE. Stanton-Eastbanc will present its plans during the first hour, including any changes to the plan since the last presentation on March 2. During the following two hours, developers will take questions and comments from commissioners and community members. A second Special Call meeting – time and place tbd – will be held in April to hear additional community input and for the Commission to vote on its recommendation to the Historic Preservation Review Board. By law, HPRB must give “great weight” to the ANC’s recommendations. The HPRB hearing will follow on April 28. 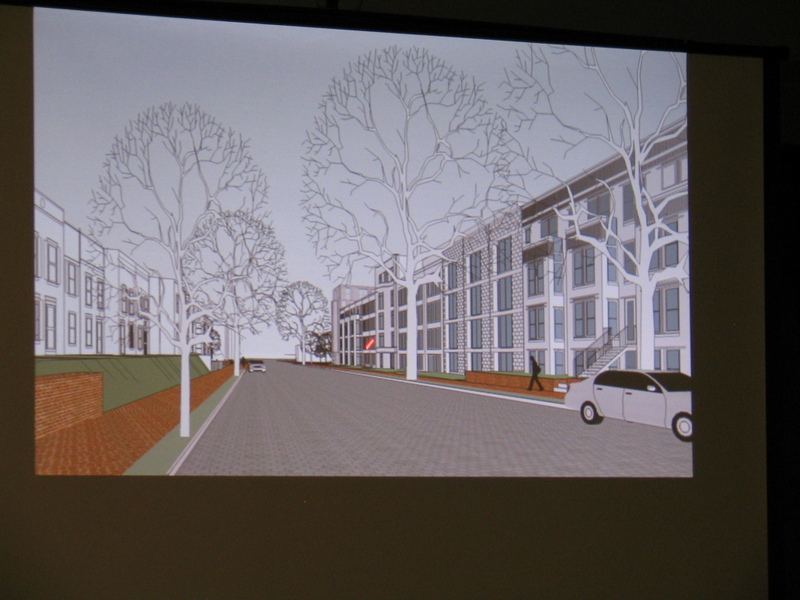 A few nearby neighbors of Hine were on hand Tuesday night to respond to ANC6b Chair Neil Glick’s request for initial feedback on Stanton’s designs, first unveiled at the Commission’s Planning and Zoning Committee meeting on March 1 and presented to nearby neighbors on March 2. Speaking for 8th Street residents in the block just north of Hine, Bill Pate (no relation to Commissioner Brian Pate) called the designs “incompatible” with the area, objecting specifically to the height of the proposed buildings and the loss of light, air and green space in the plans. Jeffrey Stine, who lives directly across the street from the Hine site said much had been made of the term “smart growth” and questioned whether the term – which is sometimes used to describe extensive massing near metro stations – is appropriate in an historic district. He described the designs as “inharmonious” with the existing neighborhood. 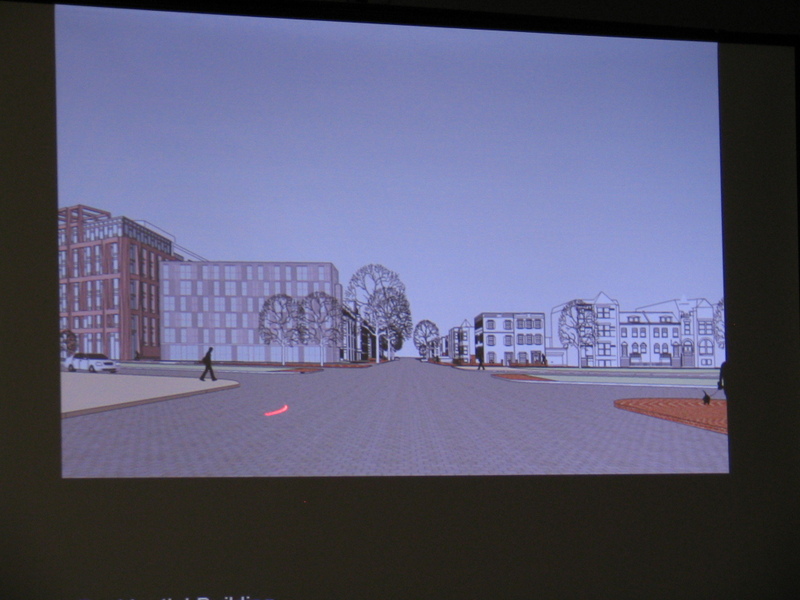 Does ANC6c Show Us a Better Way to Resolution on the Hine Site? “I think ANC 6C has some valuable lessons learned in (community involvement in development projects). Specifically, I’m referring to the process supported by the Office of Planning, development teams, members of the community and civic organizations on several major projects along the H Street Corridor – all of which started out significantly worse than (the Hine) project. That process facilitated a dialogue that sought to address design concerns from the community and from neighbors surrounding the site. An external mediator with an architectural background was brought in to shepherd discussions. Having this objective perspective was key to success of the negotiations. Community feedback was translated into a redesign and the end result of that collaborative effort was a project most could tolerate (but shouldn’t we aim a little higher than this)?. Mr. Velasco has advanced the dialogue with a concrete and achievable suggestion and one which is hard to argue against. One hopes he would use this forum to revise and extend his remarks to outline the process by which ANC6c made this happen. In order to provide additional time for public comment and Advisory Neighborhood Commission 6b (ANC6b) consideration of the Stanton Development’s Historic Preservation Application (HPA) for the Hine project, the commission will ask the Historic Preservation Review Board (HPRB) to delay its consideration of the application until April 28. The commission is confident the request will be granted. ANC6b has been caught in a time squeeze between the March 24 HPRB meeting where Stanton’s HPA had been scheduled for consideration, and a desire to provide opportunities for the community to provide input on the project. Some nearby neighbors have been very active in voicing their concerns on the project and how it will affect the quality of life in the neighborhood. The community will first have an opportunity for public comment during the ANC6b regular meeting on Tuesday, March 8, though the time will, of necessity, be limited. A second and longer opportunity will occur at the previously announced ANC Special Call meeting on Tuesday, March 15, from 6:00pm until 9:00pm at St. Coletta School – the somewhat whimsical collection of buildings at 19th and Independence, SE. 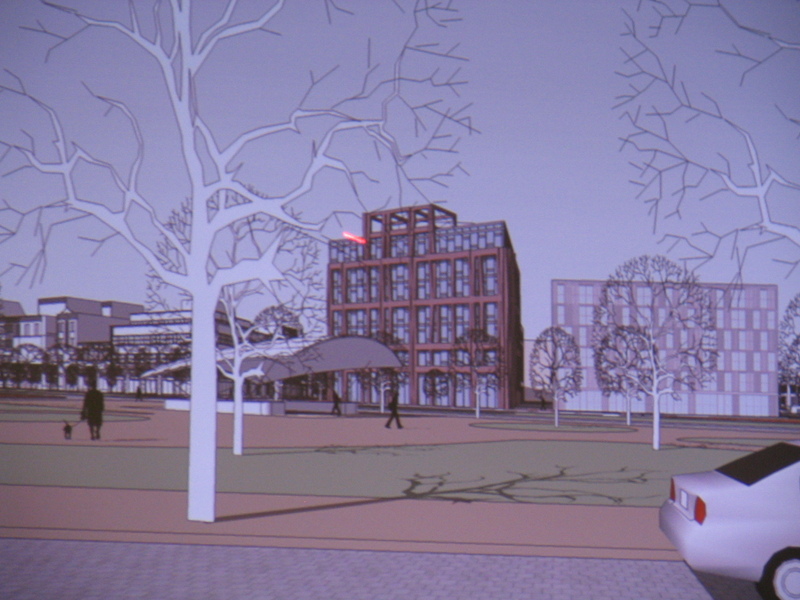 Developers will make a presentation on the current plans, including any changes since the last presentation on March 2. The meeting will then be given over to questions and comments from the community and the ANC. A third opportunity for public comment will be at a second ANC6b special call meeting which will occur in April at a time and place to be determined. The developers will report to the community on any changes in the project which develop after the March 15 meeting. ANC6b will subsequently make a recommendation on Stanton’s Historic Preservation Application to the HPRB for its April 28th meeting, and that meeting will provide a fourth opportunity for public comment. As reported elsewhere in this blog, Stanton is expected to submit the proposal to HPRB at least once more, probably in early summer, as design details are added. This will provide additional opportunities for public comment. block of 8th Street, the area on the Row with the greatest proliferation of restaurants, in December. The neighbors are formally protesting Pacifico’s application for a liquor license from the City’s Alcoholic Beverage Regulatory Agency (ABRA). Of particular concern to the neighbors are plans for a rooftop garden which will seat 45 patrons. Under the terms of the “voluntary agreement” (VA) proposed by ABC Committee Chair Carol Green, the rooftop garden would have the same operating hours as the inside restaurant – until 1 AM on weeknights and 2 AM Friday and Saturday. About half a dozen neighbors, Pacifico’s owner Xavier Cervera, and seven ommissioners huddled together in a tiny room above the Children’s Reading room in the Southeast Library last night for the ABC meeting. It was clear that lengthy negotiations, led by Green, between Cervera and residents preceded last night’s action. Sharing the details of the proposed VA, Green noted that the owner agreed to reduce the number of indoor seats from 215 to 140 and on the rooftop from 75 to 45. Additionally, Cervera agreed to enclose four sides of the garden area, as well as air conditioning units neighbors call noisy. On Tuesday, March 8, ANC 6B will take final action on the ABC Committee’s proposed VA. It is expected to be adopted. On April 13, the protest by residents will go before ABRA. If ABRA grants the license, Pacifico is expected to open in about six months. Larger images of images of the Hine project and some new ones are now available on the emmcablogs Facebook page. Please click the link on our homepage. ANC6b Chair Neil Glick recently met with representatives of the CHAMPS Retail Mix Taskforce. Currently, ANC6b is represented on the Taskforce by Commissioners Garrison and Metzger. Metzger reportedly wants off, and CHAMPS has requested two additional commissioners be added to the effort. The Taskforce expects to have recommendations by early spring. ANC6b is considering hosting jointly with Champs, a Special Call meeting in May to hear a presentation on the retail mix recommendations. Included would be a presentation on an economic survey paid for by Xavier Cervera and conducted by independent urban planning firm, Stover & Associates under the rubric of Barracks Row Main Street. The survey considers issues of space, attitude of residents, spending power of the demographics. The goal is to find which businesses will do well on Capitol Hill and attract them. 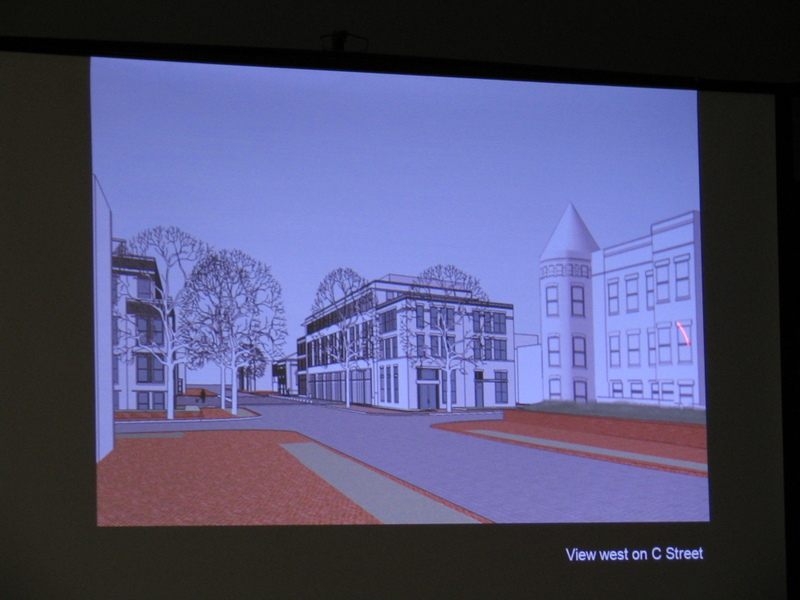 Cervera delivered hard copies of the survey to ANC6b at the Planning and Zoning Committee meeting on March 2. ANC6b’s Retail Mix Taskforce long-delayed report will be presented to the ANC at the March 8th meeting. Some of the recommendations will be delegated to committee and some – especially those concerning ABC – will be scheduled for action by the ANC. 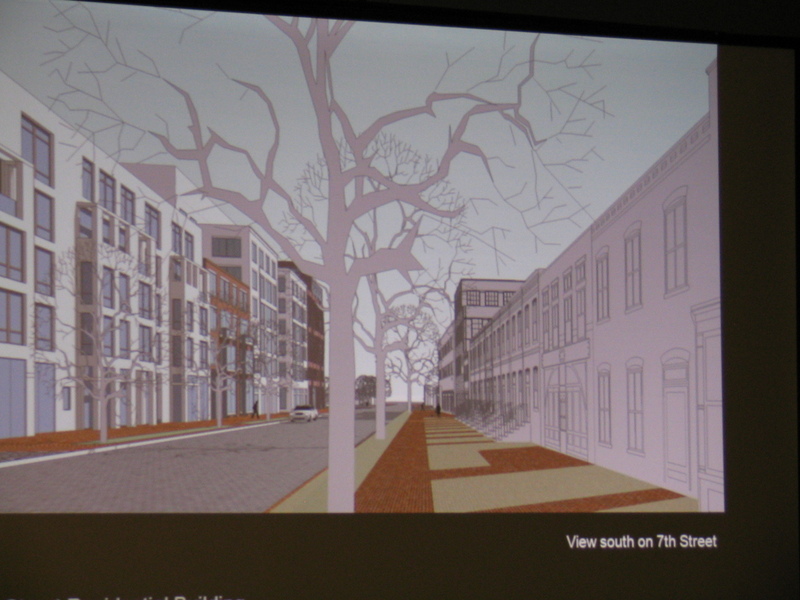 One thing likely to occur at the March meeting is a vote on a motion disavowing a moratorium for Barracks Row. For official details on the findings of the Taskforce, as reported in January on the emmcablog, see the ANC6b website. 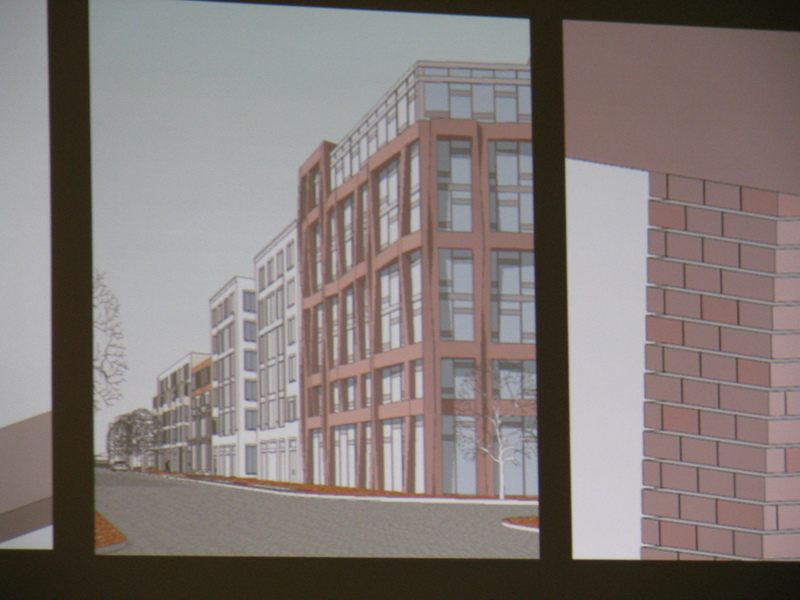 Tuesday night, Stanton-Eastbanc unveiled their latest concept drawings for the Hine project to the ANC6b Planning and Zoning Committee, Chaired by Commissioner Francis Campbell. This is the first step toward consideration of their Historic Preservation Application (HPA) for massing and height by the Historic Preservation Review Board (HPRB) on March 24th. As additional details are finalized, the plans will go back to HPRB for additional review in late spring or early summer. It’s unlikely that the 20 or so near-by residents who turned out for the meeting liked what they saw and several the ANC6b Commissioners appeared skeptical of the proposal and the amount of information they were given. One was overheard to say, “This building is too damn big,” and that sentiment seemed to express the feelings of several commissioners. Because of logistical time constraints on the meeting, Stanton’s architect, Amy Weinstein, rushed through a 20-plus minute power point presentation which was long on images and necessarily short on details. 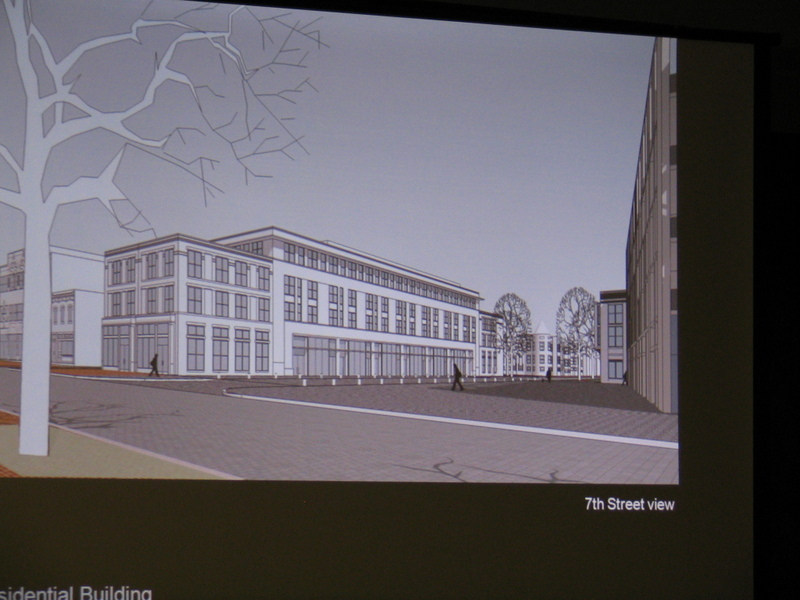 The major changes in the design since Stanton’s last public presentation February 3 include elimination of the bridge between the commercial and residential buildings on the Pennsylvania Avenue face, thus effectively separating the two buildings; elimination of some ground floor residential space on 8th Street in favor of “quiet retail,” and the addition of a sixth floor to the residential building on the Pennsylvania Avenue side to accommodate larger residential units. 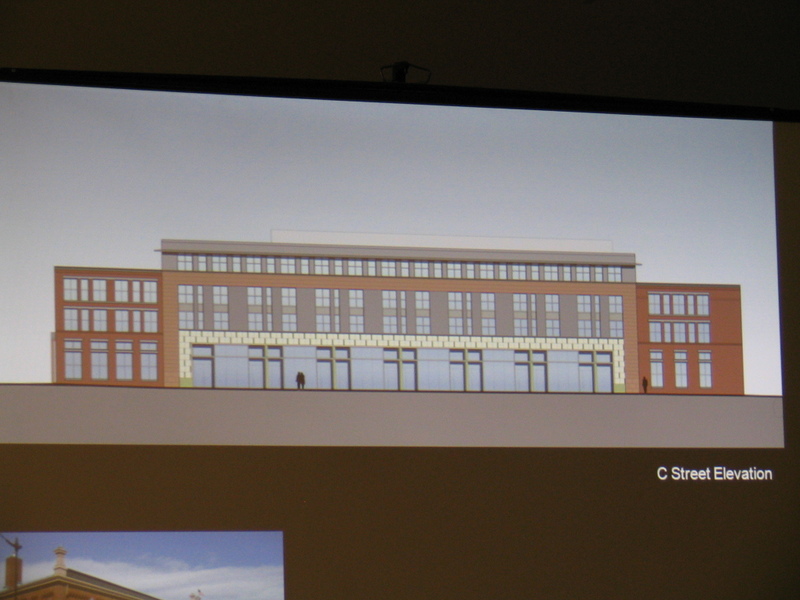 Ms. Weinstein said Stanton was still unsure whether a boutique hotel would become part of the plan. In architectural design terms, the concept for the office building on 7th Street and fronting on Pennsylvania Avenue will be a contemporary combination of red brick and pier and glass construction. The façade of the residential building will feature corbelled brick, similar to the concept employed in the façade of the Hospice Association Building on 7th Street, across from Eastern Market, also designed by Weinstein. Clay tile or slate will be employed in the façade of the north residential building facing a newly-reopened C Street. The full ANC6b had been scheduled to hear a Stanton Eastbanc presentation and take final action on their Historical Preservation Application on March 8th. 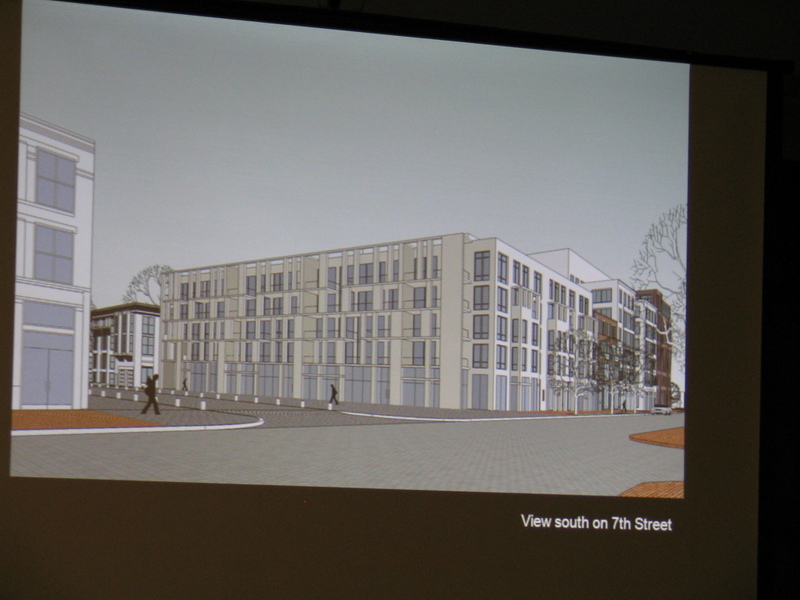 Since there was no time for questions from the commissioners or statements and questions from the community on Tuesday night, the Commission decided to hear those statements and questions at the full ANC6b meeting on March 8. A Special Call Meeting has been announced for Tuesday, March 15, at a place and time to be determined, at which Stanton Eastbanc will make another presentation for the community at large and answer questions and concerns raised by commissioners and members of the community. The Commission will then decide what recommendation to make to the Historic Preservation Office for consideration by the HPRB on March 24. For now, the position of ANC6b Planning and Zoning on the HPA is to “take no position,” and to request additional information from Stanton. ANC6b Chair Glick specifically requested the “HPRB package” and Commissioner Pate insisted on clearly outlined details on the dimensions of the project, particularly regarding height and setbacks.